Conch Shell Trumpets and Rolling Drums herald the formal opening of the LUAU as DANNY KALEIK1NI recites the traditional chant. Vahine Anamite � a starter offered by "The Tahitians." Their song is one of cheer about homesick foreign laborers on Tahiti. For every grain of sand at Waikiki � another of the appetizing melodies from the pen of Jack Pitman whose "Beyond the Reef" has become as much a part of Hawaii as the trade winds. Ihu Ohe Hanu Flute � the ancient Hawaiian nose flute, one of the world's most difficult to play, is delightfully demonstrated here by DANNY who shrugs off his remarkable talent by simply stating "I've got the nose for it!" Ipu �not a very appetizing item in itself (a large calabash used to carry water), but any of the hula girls who use it as a rhythm instrument as they dance to "Hiilawe" must certainly be referred to as a "dish"! Adventures in Paradise �prepared as never before by ukulele virtuoso Eddie Bush, whose unique style brings the tiny instrument to the full-fledged solo class of music making. Blue Hawaii �Eddie Bush returns with a tune that has become a real Island delicacy. Drink in all the beauty that is Hawaii. It's almost time for dessert. Konahema �whoever cooked up this one must have insisted on plenty of stirring. The hula dancers do this with PUILI, split bamboo rods beaten on the girls' shoulders, the floor and against each other in a very complicated routine. Iwalani �DANNY sings his own song of Island love, adding a touch of "home cooking" to the menu. Ke Kali Nei AU � lovely LANI CASTING joins DANNY in singing Hawaii's sweetest song of aloha, The Hawaiian Wedding Song. Aloha Oe � a toast to you and all who have learned to love our LUALJ. In Hawaii it is the saddest song, for it is the song of farewell. But it is also a song of hope for it adds to its farewell. . . "until we meet again." AHAAINA . . . Now there's a mouthful of Hawaiian lingo for � literally! AHAAINA means "the gather of friends to eat," and was the word used by ancient Hawaiians for what we now call LUAU. The reason for the change in usage is a good one, too, for LUAU is much more than just a Hawaiian food-fest. LUAU is a feast for all senses . . . Flaming colors that shimmer on sensuous dancing girls and men who dance with lighted swords slashing light into the tropic evening. LUAU is things to smell . . . Hidden things, like fat pigs roasting in the underground oven, done to a crackling brown � the mist of salt spray lifting with the trade winds and drifting out to sea with the scent of a million blossoms. As it goes, the breeze whispers its song through tall coco-palms. Far below, in the torch-lit clearing, natives play and sing song-stories of love and laughter as they did before Hawaiian royalty less than a century ago. For the authentic sounds of a delightful tradition as old as Hawaii, Mahalo Records went to the HILTON HAWAIIAN VILLAGE on Waikiki Beach to record one of their bi-weekly LUAUs, as presented here, for many reasons. The most dazzling reason is the star of the show, DANNY KALEIKINI. DANNY KALEIKINI is M.C. and chief entertainer at the HILTON HAWAIIAN VILLAGE. The man whose easy-going showmanship and impromptu wit make that hub of Hawaiian hospitality's LUAU the best on the beach. Besides being one of the Island's most talked-about vocalists, DANNY does Hawaiian and Tahitian dancing, plays the conch shell, ukulele, guitar and drums, and is among the very few Islanders who still play the ancient Hawaiian nose flute. Only five others have been able to master this most difficult instrument. DANNY KALEIKINI was born in 1937 on the slopes of Honolulu's Punchbowl crater. Besides criss-crossing the mainland with the Ray Kinney Group, this six-foot cosmopolite (Hawaiian-Korean-Chinese-Irish ancestry) has done some pretty hectic Island-hopping throughout his young career. 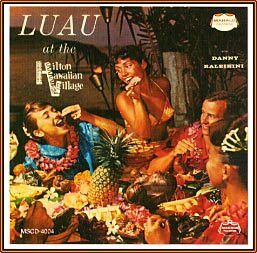 In 1959 DANNY appeared in Cuba and Puerto Rico with Sterling Mossman's Hawaiian show and recently returned from Tahiti where he was guest of honor at the Papeete Festival. Prior to his years at the Kahala Hilton Hotel, Danny joined Haunani Kahalewai at the Royal Hawaiian Hotel on a full-time basis. Later he accepted the role of emcee at the Hilton Hawaiian Village Hotel Hawaiian shows and luaus. In 1967 Danny Kaleikini commenced a long-run at the Kahala Hilton Hotel, a stay that lasted nearly 30 years. He remains active in entertainment at special events as well as continuing with the many contributions he makes to the people of Hawaii.